The Royal Gloucestershire Hussars was a volunteer yeomanry regiment which, in the 20th century, became part of the British Army Reserve. It traced its origins to the First or Cheltenham Troop of Gloucestershire Gentleman and Yeomanry raised in 1795, although a break in the lineage means that its formation is dated to the Marshfield and Dodington Troop raised in 1830. 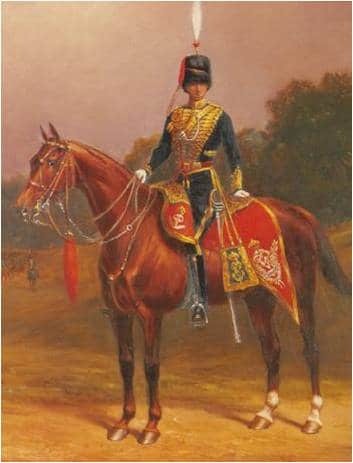 Six further troops – officered by nobility and gentry, and recruited largely from among landholders and tenant farmers – were subsequently raised in Gloucestershire, and in 1834 they came together to form the Gloucestershire Yeomanry Cavalry. In 1847, the regiment adopted a hussar uniform and the name Royal Gloucestershire Hussars. Originally intended to counter insurrection and a French invasion that never materialised, the yeomanry's first deployments were ceremonial and as mounted police during times of civil unrest. Three Gloucestershire troops were deployed to Bristol on two separate occasions in the 1830s in support of the civil authorities. From the mid-19th century, the yeomanry's policing role diminished with the establishment of a civilian police force, and renewed fears of invasion turned its focus to national defence. 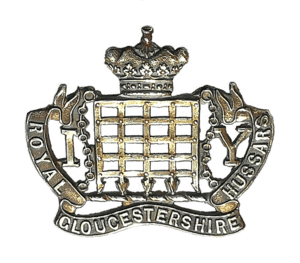 The Royal Gloucestershire Hussars' first battle honour was won in South Africa during the Second Boer War, when a contingent of Gloucestershire yeomanry served as mounted infantry in the Imperial Yeomanry. Before the First World War, all volunteer forces, including the yeomanry, were brought into the Territorial Force. On the outbreak of the war the regiment raised a second-line unit, which remained in the UK and became a cyclist unit in 1916, and a third-line unit, which served as a reserve. The first-line unit saw action as infantry at Gallipoli and as cavalry in the Sinai and Palestine Campaign; in the latter it fought both mounted and dismounted from the Suez Canal to Aleppo in modern day Syria. Following the war, the regiment was downsized and converted to the 21st (Royal Gloucestershire Hussars) Armoured Car Company. When the United Kingdom began mobilising again in the late 1930s, the company converted to an armoured regiment and was restored to its former name. On the outbreak of the Second World War, the Royal Gloucestershire Hussars once again raised second- and third-line units. The first-line regiment remained in the UK as a training unit, seeing service overseas only after the war as part of the army of occupation in Austria, and the third-line regiment was actually a troop-sized unit acting mainly as a deception designed to disguise British armour strength and disposition. The 2nd Royal Gloucestershire Hussars fought in North Africa, initially attached to the 7th Armoured Division (the Desert Rats). The regiment suffered heavy losses during Operation Crusader and the subsequent Battle of Gazala, twice being taken out of the line for refit, and was variously equipped with Crusader, M3 Stuart and M3 Grant tanks. When it lost two commanders killed in action in quick succession, the regiment's individual squadrons were used to reinforce other units, and the 2nd Royal Gloucestershire Hussars was disbanded in 1943. Reduced back to a single regiment after the war, the Royal Gloucestershire Hussars was equipped with armoured cars and given a reconnaissance role. Repeated reorganisation of the Territorial Army in the 1960s reduced the regiment to a squadron assigned to an infantry role. In the 1990s, the squadron returned to an armour role in the Royal Wessex Yeomanry, tasked with training replacement crews for the regular army's Challenger 2 tanks.